This article from the Walll Street Journal discusses rough times for oyster farmers in the Gulf. It will be interesting to see if a Southern shortfall leads to higher revenues for North East oyster farmers. It's a tough time for fans of Gulf Coast oysters, as a prolonged swath of toxic algae in the Gulf of Mexico has delayed the start of the Texas oyster-harvesting season. The algae outbreak, known as a Red Tide because it can turn waters red or brown, is the most widespread on the Texas coast in more than a decade, and threatens to render many millions of oysters toxic. State officials will not say when or if they will allow the harvest—scheduled to start this past week—which last year yielded 5.2 million pounds of the bivalves. The Red Tide is just the latest problem for the Gulf oyster industry, which supplies the key ingredient for many of the region's specialties, from the po' boy—a submarine-style sandwich often filled with fried shrimp and oysters—to seafood gumbo. 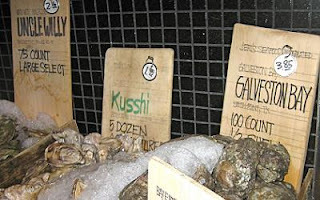 In Texas alone, oyster sales between 2006 and 2010 were worth anywhere from $8.8 million annually to $19.2 million to fishermen, while state economists say the industry's overall impact on the Texas economy is typically at least $25 million a year, according to an official at the Texas Parks & Wildlife. In Texas alone, oyster sales between 2006 and 2010 were worth anywhere from $8.8 million annually to $19.2 million to fishermen, while state economists say the industry's overall impact on the Texas economy is typically at least $25 million a year, according to an official at the Texas Parks & Wildlife Department.Elsewhere in the Gulf, Mississippi last month closed its oyster season, which runs from October to April, after determining that recent flooding upset the salinity level that oysters need to thrive. "The season could be reopened but it's not likely," said Joe Jewell, a staff officer at the Mississippi Department of Marine Resources. About 1.5 million pounds of oysters came from the state last year, according to federal data. Louisiana is allowing oystermen to ply their trade this year, but experts there are not expecting a big harvest, in part because of the aftereffects of the Deepwater Horizon oil spill and cleanup. Last year's 6.7-million-pound harvest was among the lowest in 60 years. "We expect a below-average season on the traditional public oyster seed grounds due to reduced oyster stock size," said Patrick Banks, a marine biologist with the Louisiana Department of Wildlife and Fisheries. Scientists don't know what causes the Red Tide, which crops up every few years but is usually limited to the southernmost parts of Texas and dissipates after a few weeks. The current outbreak is now in its second month and covers a vast swath of the Texas coast, from South Padre Island to Galveston Bay. Marine biologists say this summer's drought in Texas has helped prolong the Red Tide by increasing salinity levels in the Gulf—conditions in which the algae thrive. The shrimp, crab and fish industries should be largely unaffected, scientists said, as Red Tides typically don't kill enough fish to pose a serious threat to the Gulf's fish population, while the toxin produced by Red Tides doesn't accumulate in the edible portions of shrimp, fish and crabs. But, the oyster industry will bear the brunt of the outbreak, as oysters that ingest the algae can be toxic to humans, causing nausea and other stomach distress. It can take months before Gulf oysters detoxify to safe levels, Texas officials said. "We need cold weather and rain and we're not getting that," said Meridith Byrd, a marine biologist with the Texas Parks & Wildlife Department. In the meantime, oystermen in Texas are anxiously biding their time, as they catch up on dock work and other tasks that often take a back seat when the harvesting season begins. "Oysters are 100% of what I sell," said Tony Jurisich, with U.S. Sea Products Inc. in Texas City, Texas. "If the bays are closed, I don't have any income." Seafood restaurant owners say they are scrambling to find oysters as supply shortages have caused prices to go up by 10% to 30%—increases the owners say they so far are not passing on to customers. "It's a mess," said Herb Story, the owner of S.& D. Oyster Company, a Dallas restaurant that dishes up as many 20,000 oysters weekly. So far, he said, he has been able to keep customers happy by casting a wide net for oysters in Florida, Alabama and other Gulf Coast states. But for those who want Lone Star oysters, he said, "You just have to throw up your hands and say we are subject to the effects of Mother Nature."